Happy New Year! I hope this finds everyone already recovered from New Years Eve? Something light today. I had some time and someone had asked me an odd question recently so I thought I would answer it in this blog. The question was why do I use vSphere Tags and Notes. Lets start with the Tags and Notes from a VM in my lab. Just so we see what we are really talking about. Note how the Notes (pun intended) shows the history of the VM? Who and when things were done. Sort of handy to have it all right there. The tags show when the VM was provisioned, who was the owner, support resource and the application. Good info to have right? The person who was asking me about this thought this was the end of it and why bother – he could remember what was necessary. I cannot remember everything so I do this to help me remember what is necessary. Like who to call when there is about to be an unexpected outage (call owner)! 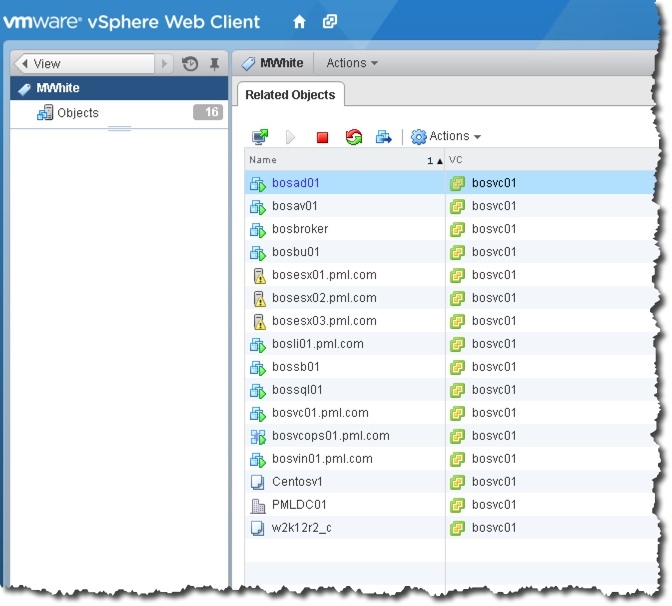 Here is another shot of a VM. This one is a View server. What if I want to work on the View related resources. Maybe a View upgrade or training or whatever. See what happens when I type View into the Search bar? See how it finds everything with the word View in it? But notice how you can click on them too? Lets click on the Tag named View. 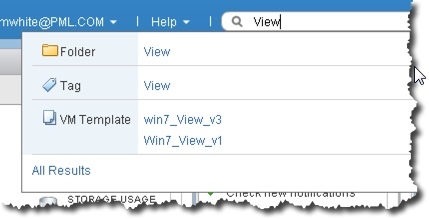 Now we have in one place the VMs that are tagged with View. Now we can work on these servers easily. This is a small example but here is a bigger one when I search for all that MWhite owns. We can see VMs and ESXi hosts. So everything I need to work on in one place. So the reason I use tags and notes is so that I can have a short summary about the VM – like what was changed on it recently but also so I always know who to call if it becomes necessary – either the application support guy or the business owner. I find this to be quite handy. So if you don’t use tags or notes maybe you should check them out. 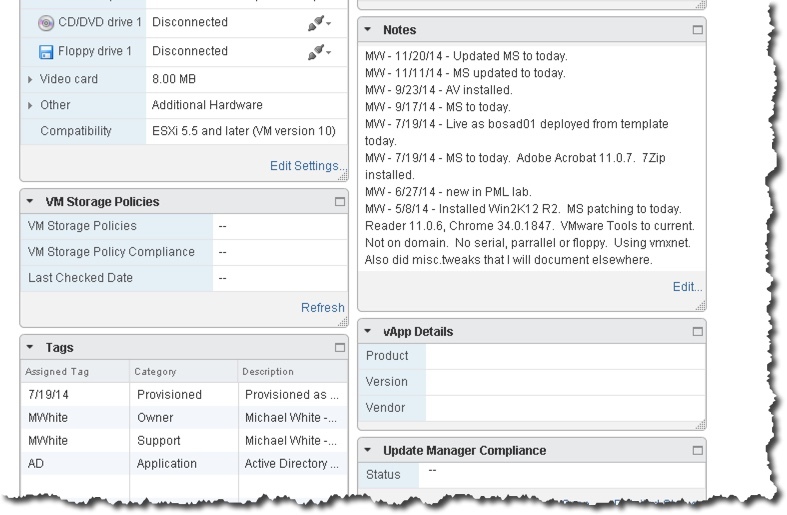 If this is all new to you, there is help in the VMware documentation that can help you get started.